This book sounds incredible! I absolutely love anything to do with Atlantis, or any inkling of mythology. That alone caught my interest. The mention of quirky characters and steamy romance definitely sweetened the deal. I have to read this one. Wow! I discovered within the last year that I really like dystopians when I read Divergent (another YA series). Since then I’ve read several more. The concept for this story sounds awesome. I would love to read it (and, in fact, shall add it to my list). 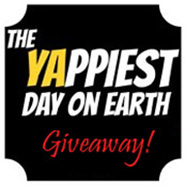 I have to say I’m loving and thoroughly hooked on your ongoing fun and fabulous giveaways. 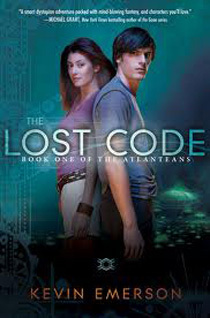 And lets just agree that, Holy-hoping-Atlanteans,”The Lost Code” has one heck of an amazing premise. No question that any mention of the ever-mysterious Atlantis is certain to pique interest, but the road this story travels sounds like a guaranteed page-turner. Love that our hero starts his adventure with a furlough from life underground–a sweet deal until he lands in Camp Eden and the plot thickens! AND super cool that this is book ONE of a series! I think it’s difficult to do a topic like this in a fresh, page-turning way but it sounds like this one hits the mark. I’m always on the look out for books that take a theme that’s been done before where the author gives it an unexpected twist. 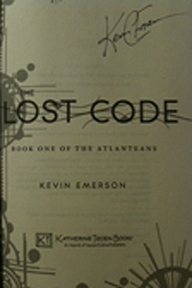 Kevin Emerson is super nice in person and I would love to see what he has written. This quote that you posted just makes the book sound that more amazing! “Before the beginning, there was the end.